Fed up with having to constantly pack up your painting area? Can’t keep track of all your paints and tools? 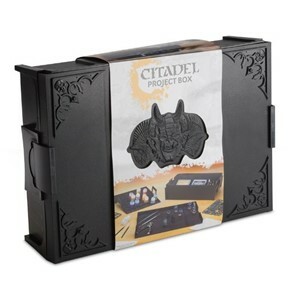 The Citadel Project Box is just the thing you need. A combined storage box and work space, it will keep all your modelling equipment in one handy place that is easy to store. The Citadel Project Box has an internal removable rack that can store up to 49 paint pots. Once placed on a flat surface the rack tilts gently towards you, allowing a better view of all the colors at your disposal. It also includes storage slots for your brushes, Citadel Fine Detail Cutters, Citadel Drill, Citadel Mouldline Remover, Citadel Super Glue, Citadel Plastic Glue, Water Pot, Citadel Palette Pad and Citadel Cutting mat. The lid is reversible and becomes an area on which to paint and model your miniatures with specific locations designed to fit the Citadel Cutting Mat and Citadel Palette Pad.